10 months ago, in December 2012, 27 people have been found dead here in Thermi. On the 14th in the afternoon a 16-year-old unaccompanied minor from Afghanistan was rescued by Frontex in the sea near Lesvos. He had been on a boat with more than 30 others and their dinghy got in distress in the night of the 14th/15th. 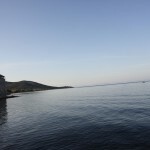 The next day three dead people were found in Thermi and only after that the Greek coast guard started a search and rescue operation to look for further survivors. 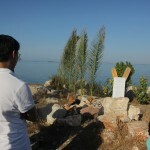 During the next days more and more dead people were found at the beaches of Thermi – in total 27 bodies. Some remained missing. 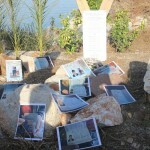 Their names we don’t know, but many of them are buried in the cemetery in Mitilini. We will go there tomorrow. 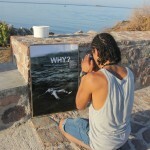 In March 2013 another tragic incident happened at the coast of Lesvos. The father of a one of the drowned is today here with us. Thank you for coming! He called him and hoped to find him in safety 1 hour later but then the mobile was off. He informed the police in Athens asking them to report the son missing in Lesvos. A few days later he himself went to Chios and to Lesvos to look for his child. On both island the authorities did not immediately register the missing. The search and rescue operation started more than a week later, on 15th of March. All of these deaths have a face, a name. All of them leave behind relatives and friends. Besides the bodies also their hopes and dreams are lost. We want to give back a piece of dignity, to those whose death disappeared – right here – into the senselessness of the European borders – and we want to thank those who risk their lives to rescue. We gathered for giving back a piece of dignity also to those who survived. A piece of dignity that was lost on the way to Europe, like the passports or the photographs showing the faces of the beloved ones that disappeared in the water. Some came to mourn their lost relatives. We thank you to be here, together we will not forget your beloved. A warm welcome also to the friends who accompanied you in March and also today. Solidarity and friendship can help us, to survive the loss, that is without words. We are very thankful that you have come together. Some live here on the island and experience regularly dead people being found on the beach. Some of us here have had the experience of recovering bodies. Some are here on a journey back to the place of their first arrival in Europe. They have experienced the hell of Pagani – but also the solidarity of the people here on Lesvos. They made a brave step to travel back here to encourage and support the newcomers. Some came already several times, during a Noborder camp that took place in 2009, where they shared some days of protest against this deadly border regime. 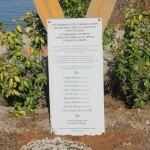 In 2010 we built a first memorial in Korakas, to mourn for those who had died in 2009. Everywhere around this border we also find people who have not closed their eyes. Thanks to all the unknown people who help migrants on their way silently and on an every day level. Since we have been here, on this journey back to the border, we have been received, treated and welcomed like friends by the inhabitants of Mitilini. We would like to thank them for not having closed their eyes. Thank you all for your hospitality, your helpfulness and your support, helping migrants on their way to a better life and on an everyday level. With the open welcoming centre that existed in Pikpa you have set an example that goes beyond the island: you made the prove that a warm welcome to refugees is possible! We know that those who would want to find a place to rest will find doors opened to welcome them here. This is like a light-tower in a time were it is common to detain those who survived this difficult trip. Thank you. Our biggest pleasure today is to have some amongst us who have put their own life in danger to rescue others: we thank you and all the other fishermen who rescued people at sea. In the early morning of the 15th of September twelve refugees from Syria were rescued by the fisher boat Kapetan Stratis and the cargo ship YALKER. Here on the island there are many stories of rescue. We thank to all those unnamed brave people. Thanks also to those who had the very sad job to recover the bodies from the water without any chance to help them any more. We mourn together with you who see their faces still in front of your eyes. Here and today, at this place of failure and loss, we want to stop for a moment and create a space for all those who lost their lives. Remembering here means to save the stories of the uncounted who died at the borders of Europe. There would be many more names and many more stories. We will never forget the others but in this moment we will remind those who died in March 2013. So let us speak out their names. Lujain Hashash (3 years old) – he lives! Abdullah Hashash (6 years old) – he lives! Jinan Hashash (7 years old) – she lives! Kadri Tarkmani (14 years old) – he lives! Kamar Seni (17 years old) – he lives! Muhamad Seni (21 years old) – he lives! Fatima Hashash (30 years old) – she lives! Mustafa Sahrazi (30 years old) – he lives! Omar Hashash (40 years old) – he lives! This Europe is not safe, human rights and refugee rights have lost all relevance! The victims ask the ones alive to take action against this Europe of Frontex – borders and walls. They demand us to struggle and to invent a Europe of solidarity, overcoming the deathly migration regime. For the ones who will pass by in the future, the fountain that will be built later on should be a place to rest on their further way, providing them with water and the feeling that they are welcome. We invite you to have a rest – and then to move on: to tear down the borders and to built another, a welcoming Europe.